Free, as in no lines to follow! I have been experimenting a little with this concept. Sometimes, it feels like too much to force myself to stick with the lines on the fabric. I'm not saying they are all bad (they are often very good! ), but I am finding I need at least some freedom to see what comes out. In this little embroidery, it is done entirely free. I think it's my first attempt being totally free of any lines. It's a little abstract. I did start with an idea. It didn't quite look as I thought it would, not that I am sure what it should have looked like. I wanted to couch down thick threads and hoped they might look like barnacles. Maybe they could, but I wasn't satisfied, so I put the embroidery aside and moved on to something else. But then I picked this up again and just started stitching more. The straight stitches are the water. I added clear, glass beads for the sparkle although the top photo barely shows them. I have seen other stitchers try and fail. I can tell you why they do. First, like a blank page, a blank fabric can be intimidating, how to fill it. You have to start with a spark, I like to call it. A feeling, and idea, a thought, something to begin with to drive you forward. It doesn't matter as in this case that the project leads you to another point, you just need the spark to get yourself going. Second, you must make your left brain quiet down and let the other side have a chance. You shouldn't use words, you should be very careful trying to make recognizable objects. You don't want to make the form of a tree necessarily, for example. You want to make the feeling, the impression of the tree, whatever that means to you. Maybe in the end it will be recognizable and maybe not. It all depends on what comes out. Third is most important in a way. Shut off the inner critic! It will stop you in your tracks every single time if you let it. Even this project I have shown, what did I tell myself? Oh those barnacles don't look the way they "should". Put the project down right now and do something that makes sense and is easy to understand. I decided to pick it up again, just for the heck of it, and now I am glad I did. It doesn't matter to me if you like or understand the project. It means something to me, and I feel on some level it was a success, plus I can tell you that I didn't want to put it down, and I really looked forward to picking it up again. That feeling I don't often get. Yes, even me who loves to stitch isn't always looking forward to the next opportunity to pick up the needle. Now one more final comment. You may say, well, I don't really like this type of stitching, I prefer to make projects with pictures of recognizable forms, and I really don't want to risk making a mess of a project by being free because it takes too much time to embroider, better to stick with a project with a known result. First, these projects don't have to take that much time. This one is quite small. It was really a matter of a few hours. Second, so what if it is a "failure"? Use it as an opportunity to learn instead. Keep it as a record of progress. And finally the last thing are those that say they don't like the abstractness of it all. I will tell you that nearly all artists employ some kind of abstractness in their work, they can't help it. It's how you help create the feelings that you want your work to convey. Dealing with only the abstract for awhile will help you learn to use it, so when you go back to your regular type of projects, it will be another tool to use to create something with more feeling and meaning. Ahh, the left brain-right brain thing. My biggest road block. I have to force myself to make things that have a sole purpose of my own pleasure and satisfaction. Do you know Penny Berens? If not, please visit her blog. She does amazing improvisional stitching. I love the banner she is currently stitching. A type of daily journal and no lines. You like WW's blog and I am sure you would enjoy meeting Penny too. Have a fab day. I'll enjoy watching your journey without following the lines. What a perfect finish for this wonderful piece! I never get enough of seeing your work! Working abstract designs is completely different to figurative pieces - a very brave change of direction, very successfully carried out! Your free embroidery turned out beautifully, Emily, most especially because you enjoyed the act of freely expressing yourself. It's rather difficult to really express oneself while following pre-determined lines. They can serve as guides, but we shouldn't feel entrapped by them. And the beauty of abstract expression is that it can be interpreted many different ways depending on the viewer. 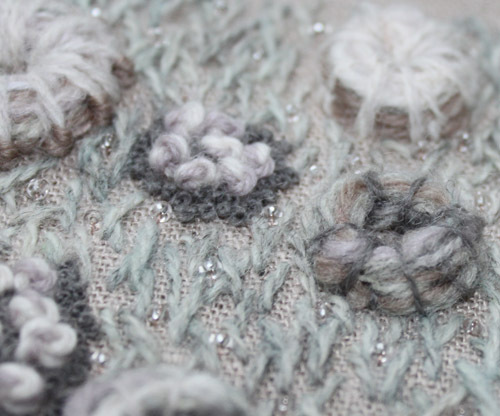 This piece with its soft frosty hues and hint of sparkle make me think of snow and ice. And it can be appreciated entirely for the beauty of color and textures without having to represent anything in particular. Well done! Thanks for sharing this post Emily. I know exactly what you mean about trying something new and experimenting. I usually have to feel 'brave' to do it, but I always, ALWAYS find something about my experiment to take away and use another time, even if I'm not that keen on the whole thing. I have such limited time to sew that I find it hard to avoid the feeling that I'm wasting my time, when another part of my mind and my hands just want to be free for a little while. It's nice to other people working to overcome the same challenges! I love your words! They resonate in my mind. It's not easy to translate into words the process. I understand and share what you mention above. Although I am French and have to make an effort of translation ^ - ^. I just found out the hook and I had to leave my comfort zone. I have the experience of that you say. The left brain ... hoo! ha! Terrible! I think we also need to DARE! Daring to try, dare to make mistakes and do not succeed the first time.Dare not to be in security ... without pattern ... After you're happy because we have advanced even if there are things not beautiful to watch. It is very hard for some people: do not perfect the first time but progress nonetheless. I will read and re-read your words because I like to share with my readers. You put into words my emotions and my feelings. Thank you! I discovered your blog ... I admire your work. 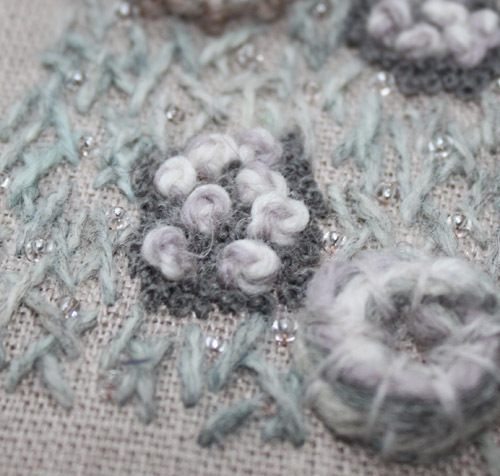 I want to re-make ranges embroidery ... a day. Oh, this is exactly how I feel right now as I sit stumped over a new project! I have overthought, overanalyzed, and overworried about the end product on my beige linen/blank slate napkins. I need to just jump in with my feelings. Thank you for the push.